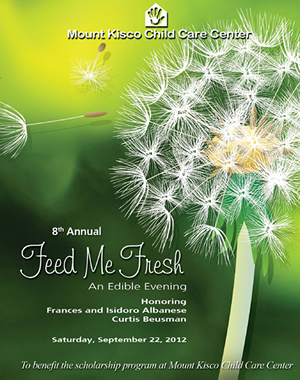 MKCCC Feed Me Fresh – get your tickets now! Our mission: Mount Kisco Child Care Center provides high quality, affordable childcare and early education to a diverse group of 160 children, ages three months to eleven years, in a healthy and enriched environment. For over forty years, MKCCC’s core mission has been to ensure that our programs are accessible to all, including those with limited financial resources. Highlights of our programming include a farm-to-table curriculum with an onsite greenhouse and garden, a computer lab, and intergenerational programming. Our Scholarship Program: The Mount Kisco Child Care Center reflects the rich diversity of our community. Our safe and nurturing environment creates and fosters understanding, cooperation, and tolerance with long term benefits for our children and society. We believe that every child has the right to safe, inspiring and purposeful care and education regardless of their caregiver’s ability to pay. For more than 40 years, MKCCC has provided financial assistance through its Scholarship Program. Through the generosity of many individuals and businesses in our community, our Scholarship Program allows families to work while the children receive education and skills that prepare them for school and the future. Mount Kisco Child Care Center’s Annual Feed Me Fresh: An Edible Evening, is a one-of-a-kind tasting celebration, featuring offerings from Northern Westchester’s top restaurants and Chefs, fine wines, great friends, cocktails, music and dancing. It is a night to celebrate the fantastic flavors that our best local Farmers and Chefs have to offer, all to benefit the children and programs of Mount Kisco Child Care Center. Please join us under the tent on the beautiful grounds of Ivanna Farms in Bedford Corners. All funds raised at this event will be used to provide scholarships to children whose families have limited resources. Saturday, September 22, 2012. Click here to learn more and buy tickets! Visit Mount Kisco Child Care Center at www.mkccc.org.